The 4x400m girls freestyle relay presentation which saw COPS teams finish first and third. City of Peterborough Swimming Club (COPS) have topped the medal table at the East Short Course Championships. They finished the three-day meet in Luton with a massive haul of 32 medals - 12 golds, 10 silvers and 10 bronze - and finished 10 medals ahead of second-placed Hatfield and 16 medals in front of third-placed team Ipswich. Katie Brown (16) was the star of the show with six golds and a silver. She won the 200m fly final on the second day along with a 4x400m medley relay gold with Leah Roughan, Rachel Wellings and Mollie Allen. 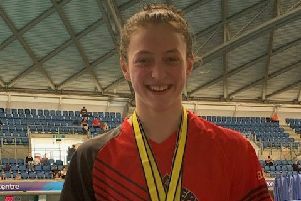 And then on the third and final day, she added to her impressive tally by claiming the 200m and 400m freestyle individual golds - both by convincing margins - and won two more relay golds - the 4x800m freestyle with Roughan, Bethany Saunders and Wellings, and the 4x400m freestyle with Saunders, Allen and Wellings. She then completed a great weekend by winning the silver medal in the 100m butterfly final. Leah Roughan (16) also had a great championships. She won individual golds in the 400m individual medley and the 100m and 200m breaststroke - the latter in a new East Region record time of 2:26.83, a silver in the 50m breaststroke and she was in two winning relay teams. And it was certainly a last day to savour for Rebecca Burton (17). After winning a bronze in the 200m breaststroke and a silver in the 200m individual medley, she finally made it to the top of the podium when she led a COPS 1-2-3 in the 50m breaststroke final with Roughan taking the silver medal and Wellings the bronze. Gold - 200m individual medley - Mollie Allen. Silver - 4x800m relay (Poppy Richardson, Christie Woods, Mollie Allen, Taylor Goodby). Silver - 4x400 medley relay (Bethany Saunders, Rebecca Burton, Taylor Goodby, Christie Woods). Silver - 100m individual medley - Rachel Wellings. Silver - 50m backstroke - Mollie Allen. Silver - 200m backstroke - Bethany Saunders. Silver - 4x800m freestyle (Poppy Richardson, Christie Woods, Mollie Allen, Taylor Goodby). Bronze - 4x400m freestyle (Poppy Richardson, Anna Blakeley, Leah Roughan, Christie Woods). Bronze - 400m individual medley - Poppy Richardson. Bronze - 200m butterfly - Taylor Goodby. Bronze - 100m individual medley - Rebecca Burton. Bronze - 50m breaststroke - Rachel Wellings. Gold - 200m butterfly - Joshua Graves. Silver - 200m backstroke - Jamie Scholes. Silver - 200m freestyle - Daniel Leigh. Bronze - 100m butterfly - Daniel Leigh. Bronze - 400m individual medley - Joshua Graves . Bronze - 1500m freestyle - Jamie Scholes.